Time to break out the elastic-band sweatpants and kick off the holiday season with some good old fashioned family, friends, food and festivity. 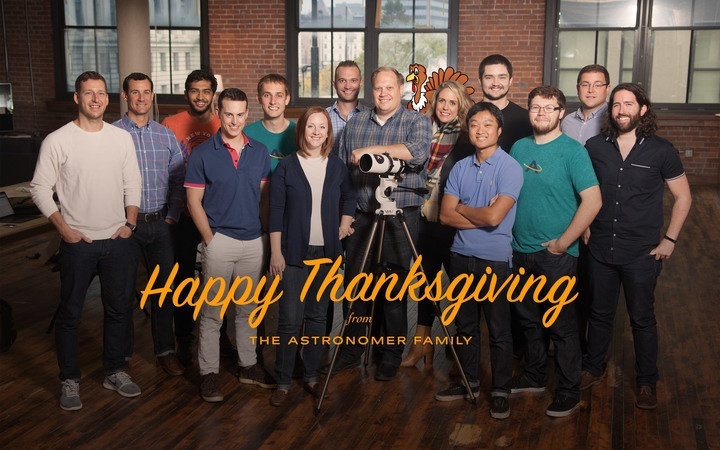 In light of this national celebration and one of our favorite holidays, we thought we’d offer you our warm wishes, Astronomer-style. That is, we’d extract some interesting and perhaps rather insightful Thanksgiving data and transport it, from us to you. We’re not sure what to make of this one, but the bird eaten at the first Thanksgiving was, apparently, maybe … eagle. James Madison once declared two Thanksgivings in one very wonderful year (1815). Americans consume an average of 4,500 calories on Thanksgiving—3,000 from a traditional Thanksgiving meal and the other 1,500 from snacks and nibbling. Here’s hoping cocktail calories are in included in those numbers! The most pinned side dish on Pinterest? Green beans. We’ll give you a head start. Your textbook might have said Plymouth, Massachusetts, was home to the first Thanksgiving. But Florida, Maine, Virginia and especially Texas disagree. Turkeys don’t all gobble; only the males do. Female hens get their own noise too, but it's more of a cluck, yelp or chirp. Side note: When a male gobbles (which really impresses the ladies), the sound can carry over a mile. The request for “ham shop” is typed into Google Maps 20 times more on the Wednesday before Thanksgiving than any other Wednesday. We also find it kind of awesome that there’s a baseline for Wednesday “ham shop” searches. In all sincerity, happy Thanksgiving from all of us!